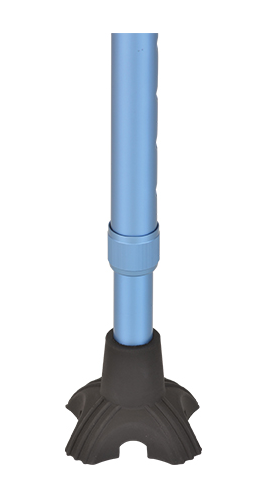 The Mini Quad Cane Tip adds stability and pivot to your cane, reduces impact on your hand and wrist, and even allows your cane to stand upright on its own. Its small size also makes it ideal for travel just pair it with a folding cane and go! It features stability and traction on uneven terrain, fits canes with a 3/4 diameter, base dimensions are 3 x 3.